Roasted asparagus with cheese and herb and garlic is the best side dish to any meal! This dish is Keto friendly, if you are into that sort of thing. Toss some asparagus on a baking sheet, add some cheese with a mixture of garlic and cilantro, and you’re practically good to go! Not everyone likes cilantro, so you can easily substitute it for parsley. 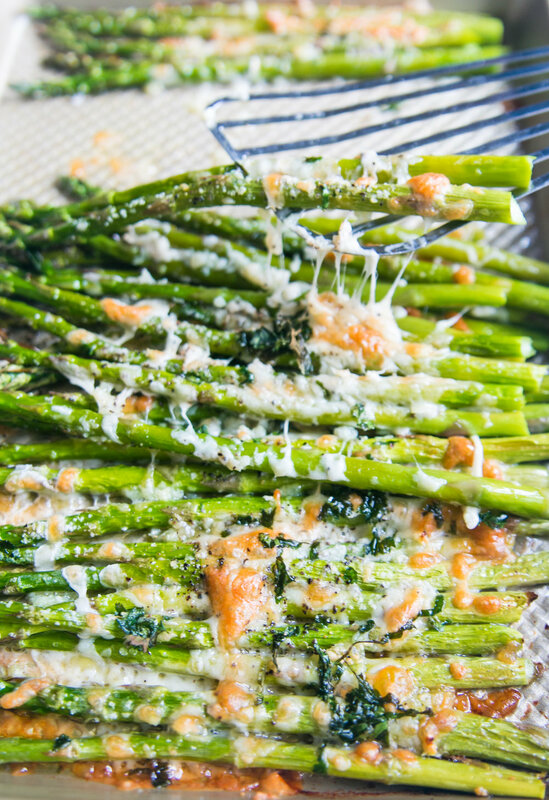 There are just a few ingredients for the best cheesy asparagus. Asparagus, cheese, garlic, olive oil, and just 10 minutes in the oven. Easy! Arrange asparagus on a baking sheet. In a small mixing bowl, whisk together olive oil, garlic, salt, black pepper, and cilantro. Pour over the asparagus and give a little toss to evenly coat each spear. Bake for 15 minutes or until the cheese begins to golden. In a small mixing bowl, whisk together olive oil, garlic, salt, black pepper, and cilantro. Pour over the asparagus and give it a little toss to evenly coat every spear.